Andy Jassy heads Amazon Web Services, the cloud-computing division that drives much of Amazon.com’s profitability. He spoke with The Seattle Times before re: Invent, an annual AWS conference in Las Vegas that takes place this week. 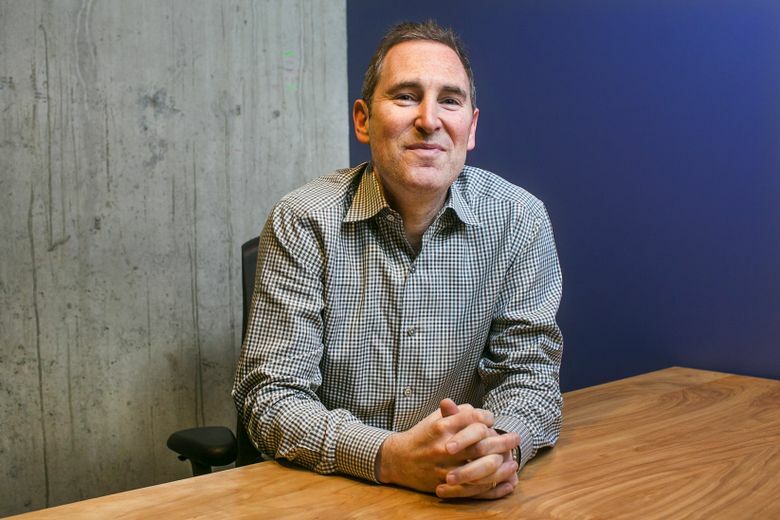 Andy Jassy, a 19-year Amazon veteran, is arguably the most powerful man in the cloud. In an interview with The Seattle Times, Jassy said that AWS could one day evolve to become an even bigger business for Amazon than e-commerce because it’s addressing markets potentially worth “trillions of dollars worldwide.” But a spinoff is unlikely because there’s “no compelling reason” to do so, the executive said. Back story: Part of Amazon.com’s senior executive team since 2002. Joined the company in 1997. Conceived the company’s entry into the music business, was director of marketing, served as technical assistant to CEO Jeff Bezos, and in 2006 launched AWS, the largest computing cloud business in the world. Jassy’s comments come before re: Invent, AWS’ annual mammoth Las Vegas conference, which this year takes place from Tuesday to Friday. More than 32,000 are expected to attend, reflecting, in Jassy’s words, the growing “movement” of builders embracing the possibilities of the cloud. “It is palpable when you’re there,” he says. Here’s an edited excerpt of the conversation. Q:AWS has evolved into a $12 billion business in a decade. Why did it grow so quickly so fast? Was that growth a surprise? A: I don’t think any of us had the audacity to predict it would grow to be that big when we were starting it. Before, companies and startups had to lay up all this capital for data centers and servers, and take your scarce resource, which in most companies is engineers, and have them work on the undifferentiated heavy lifting of infrastructure. What the cloud has done is completely flipped that model on its head so that you only pay for what you consume. You’re able to get work done so much faster than ever before. Startups and smaller companies got that revolution started, but we always expected large enterprises and government agencies to be very large AWS companies, because they have very large amounts of infrastructure to spend. Q: Where is AWS now? Where is it going next? A: We have a pretty significant market-leadership position, and we’re not close to being done delivering capabilities for our customers. We have a very broad geographic footprint, but we’re not close to being done. Over time we can expect we’ll have an AWS “region” (a cluster of data centers) in practically every Tier 1 country and a lot of developing countries as well. We have a machine-learning service that we launched about a year and a half ago, and there are a lot of artificial intelligence (AI) machine-learning capabilities coming. We have a large number of people working in AI. If you look around homes and the workplace, there are all these sensors in many devices. This is what people commonly call the Internet of Things. These sensors have a small amount of (computing power) and memory. Which means the cloud becomes disproportionately important to supplement their capabilities. Most of the big IoT cases today are built on top of AWS. We are at the start of what we think is possible. Over time, many enterprises are going to think about their own infrastructure as servers and also as devices they use to collect data, do analytics and take action back on these devices. So that’s another area of significant investment for us. Q: What are the biggest bottlenecks you’re seeing? A: There are only 24 hours in the day. There is so much that we’re doing simultaneously. We’re going to launch 1,000 significant services or features this year. We are hiring so many people all over the world and we have a very high hiring bar. We’re not willing to compromise in order to make sure we have the right quality of folks. That always takes a fair quality of focus and work from the team. Q: How do you see the competition? Who keeps you up at night? A: Probably the single biggest surprise is just how long it took for other large technology companies to build an offering here. I don’t think any of us believed, in our wildest dreams, that we would have a six-year head start. It’s not a surprise to us that every large technology company is trying to build an offering like AWS’ because it’s such a good value proposition for customers. But the offerings and the platforms are in very different spots today. AWS has a lot more capability and functionality than anybody else by a large margin, and is also iterating at a faster clip than anybody else. We have an expression we use internally: There’s no compression algorithm for experience. Q: Tell us about re: Invent. What should we expect for the conference? A: Re: Invent is different from the typical technology-industry conference in that it’s not a sales and marketing event, but about learning and education. We will have 400 different sessions on virtually every imaginable topic in the cloud. The first year (2012), we weren’t sure we could get 4,000 people to go. We’ll have 32,000 people there. It’s a lot of fun, there’s a lot of community, we’ll probably have some announcements there as well. There’s a kind of a movement around the cloud. It is palpable when you’re there. Q: What are your thoughts on “moving up the stack” (offering clients more sophisticated applications beyond storage and computing power)? A: You’ll increasingly see us build services a little bit further up the stack. The ones we choose to add are the ones our customers tell us they’d like us to build. The vast majority of applications that are really having success in the market today are run by AWS partners. We have a very large ecosystem of partners that cover the gauntlet of applications that our customers love using. Q:Will AWS become the largest business within Amazon? A: If it came to pass, it would likely take time. But I do think it’s possible that in the fullness of time AWS could be the largest business in Amazon. Part of that is because, if you look at the market segments AWS addresses — infrastructure software, hardware, data center services, plus some capability to build further up stack as well — that’s trillions of dollars worldwide. It’s a very large opportunity and we’re very optimistic about where AWS will be in the long term. Q: Could AWS operate as a company separate from Amazon? A: AWS has always functioned as an independent, separable business distinct from (Amazon’s retail unit): a different customer base, a different leadership team. Amazon, the retailer, is a really important customer of AWS’, but they’re really one of several, very important customers. One of the reasons why Netflix, (which) competes so aggressively with Amazon the retailer, is all in on top of AWS is because Net­flix knows and has seen that they’re every bit as important to AWS as Amazon the retailer is. I’ll never say never about anything, I’ve learned that in my time here. But I don’t anticipate that we’ll spin AWS out largely because there’s no compelling reason to do so. Amazon has been so generous and so gracious in funding AWS for whatever investment needs required that there is really no compelling reason to do so. Q:Has AWS’ culture had to change much in order to better serve enterprise customers? A: Over the last five or six years we’ve had to build out a really strong enterprise and public-sector capability. But what enterprises have come to appreciate is that the culture is really different. We’re unusually customer-focused. We’re pioneers. Most large technology companies have lost their will and their DNA to invent. They acquire most of their innovation. We like to hire builders that look at customer experiences as flawed and figure out how to reinvent those. Also, we’re unusually long-term-oriented. You won’t see our folks show up at customers’ doors the day before the end of the quarter, or the day before the end of the year and try to harass them into a sale not to be seen again for a year. We’re trying to build relationships and business that outlast all of us in this room. Q: Has the new CEO title changed things for you? A: No. It’s all the same. Q: What about corporate succession at the top? A: We’re really incredibly fortunate to have a leader as strong as Jeff (Bezos). I’ve been at the company now for 19 ½ years and I will tell you that Jeff has at least as much energy and passion for the business as he did when I started in 1997. Jeff will be running the business for a very, very long time. We’re lucky that he will.